Capstan - Belt Wrap | Tensor Machinery Ltd.
Our Belt Wrap Capstan is designed for applications such as Loose Tube or Premise lines and where soft or floating cores are used. The driven sheave helps ensure that the entire cable is being pulled and not just the outer jacket. This is critical for these types of cable products. The main drive sheave is typically 400 or 500 mm diameter. A 2″ soft polyurethane belt contacts the drive wheel at 180 degrees and has adjustable belt tensioning provided by an air regulator and gauge mounted in the capstan assembly. The capstan is designed for easy cable insertion with an interlocked Plexiglas safety cover. A jog button allows for product loading when the line is off. 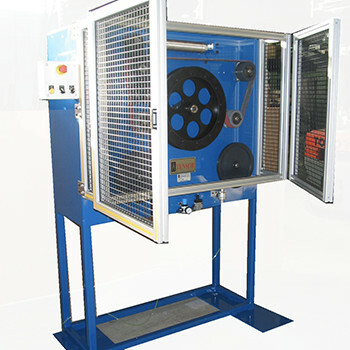 The cable deposits directly onto the floor until the start-up location is achieved. A smaller Belt Wrap Capstan is also used for tight-buffered and bare fiber. This type of capstan ensures that the product is pulled smoothly and evenly and maintains a good grip on the product. For more information on Tensor capstans, please contact us.